France is known for its chic and sophisticated lingerie. Together with the ladies of the PPF (Association des Professeurs Pergamanophiles de France), Viviane Hénon-Aubert has provided the contents of this, slightly naughty, edition. Six beautiful designs inspired by nature from Gail Sydenham. Many of her designs are based on botanical subjects such as flowers, birds and insects. The designs in this m-series therefore match the collection Botanical garden very well. Mix & Match both collections Botanical Garden of Pergamano and Aurelie. 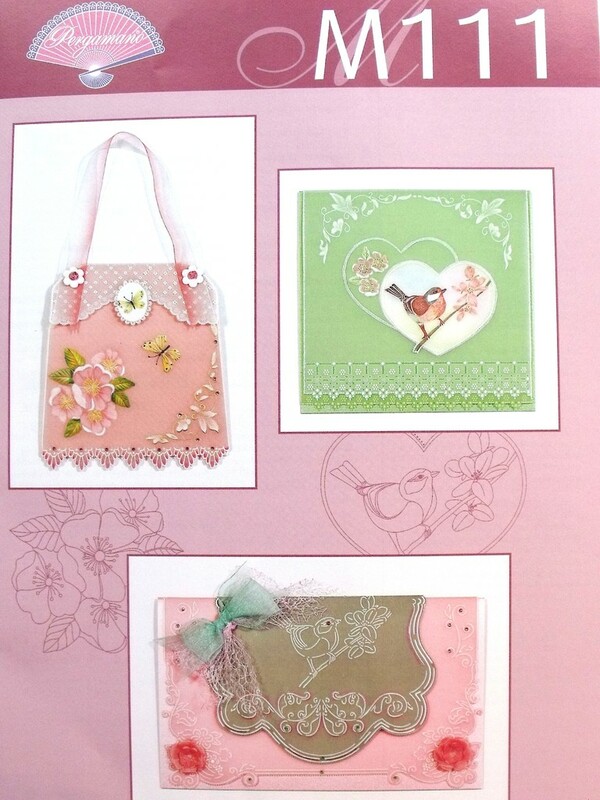 Gerti Hofman (NL) has designed and created the patterns for these 6 cheerful spring cards. You can’t help but be drawn into a springtime mood by the wonderful, soft spring colours with perga liners and of course the beautiful and colourful parchment paper. The combination with the various multi grids and perforating tools makes the cards attractiveto all skill levels and will provide you with a lot of inspiration in the crafting of these cards.You’ll find the work descriptions, colour examples and patterns for the projects in the magazine. Summer Garden card and gift tag designs. 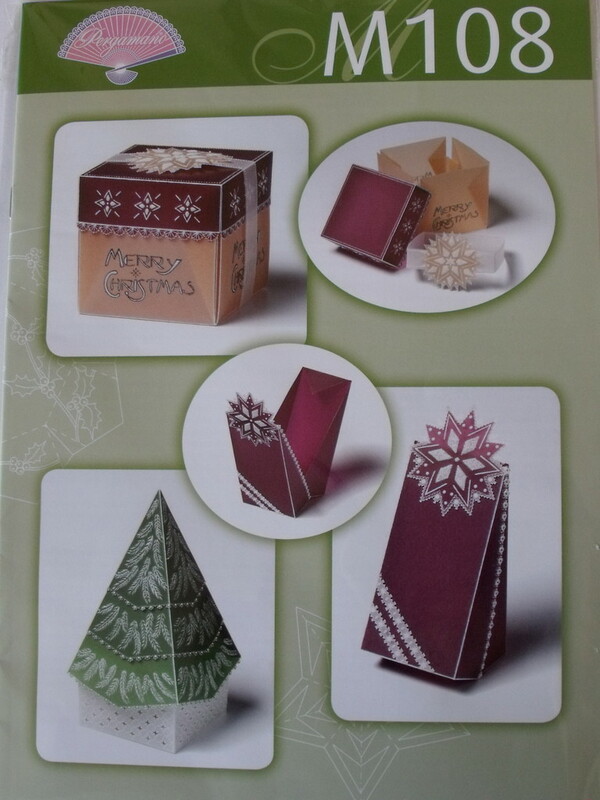 Six lovely designs for boxes. 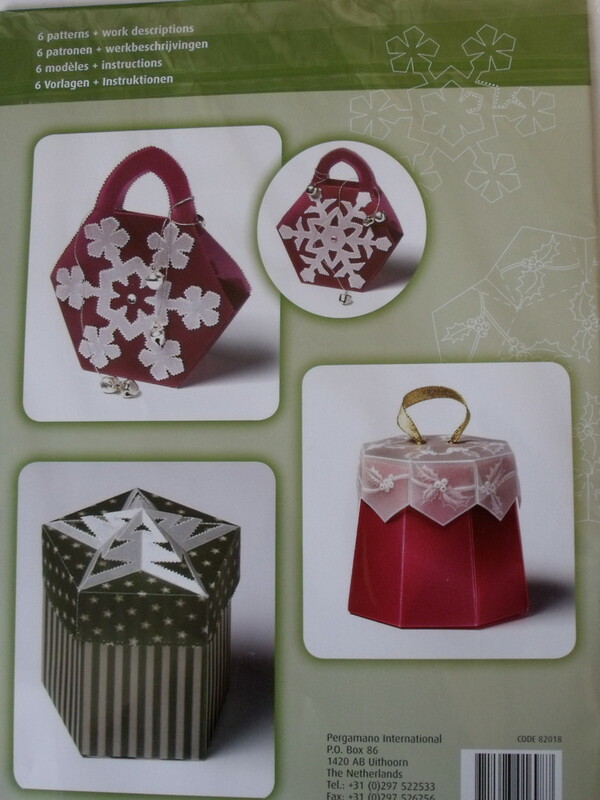 Wrap your Christmas gifts in beautiful parchment box this year. 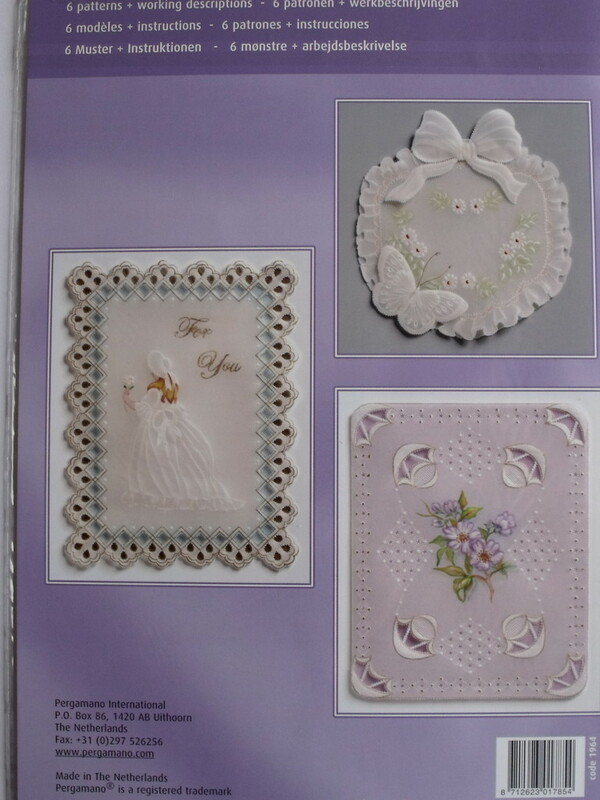 Designed by Jannie van Schuylenburg, these projects are very suitable for beginners as well as the advanced crafters. 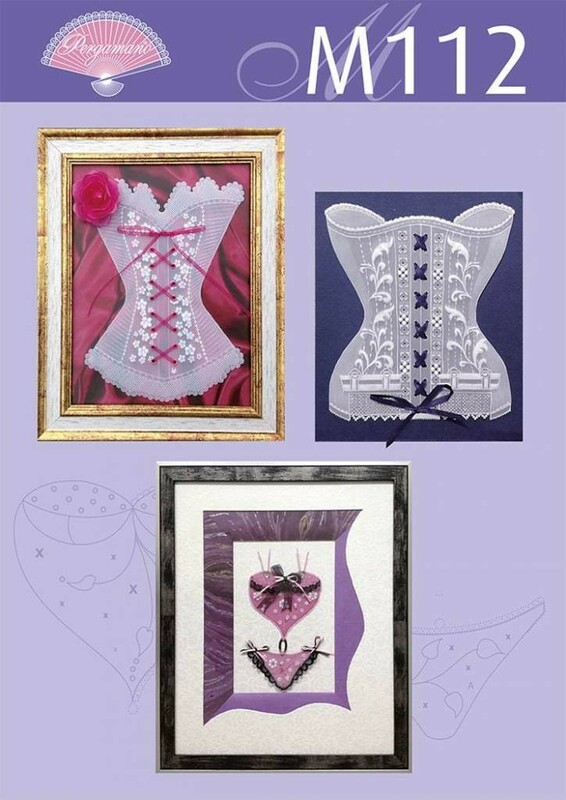 Six fabulous designs entitled 'Elegant Ladies' by Gail Sydenham. These projects are suitable for many occasions. Of all the techniques of painting on pachment hair and faces seem to be the most challenging. You can practise the techniques very well with the help of the projects in this magazine - the effects are not as difficult to achieve as you may think. 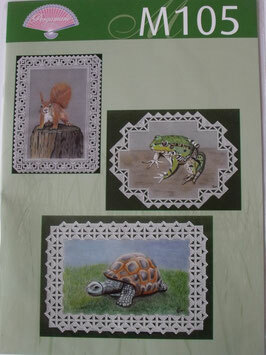 Six projects to make, baby deer, owl, hedgehog, squirrel, tortoise and frog. 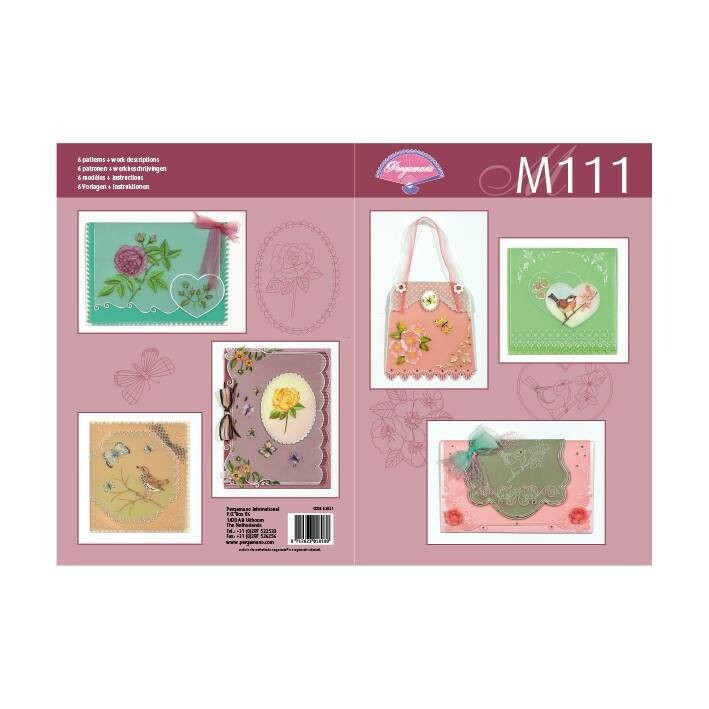 M99 Colourful flowers, 6 designs. Flowers have always been a source of inspirations for Hiskia Wittenaar (NL). 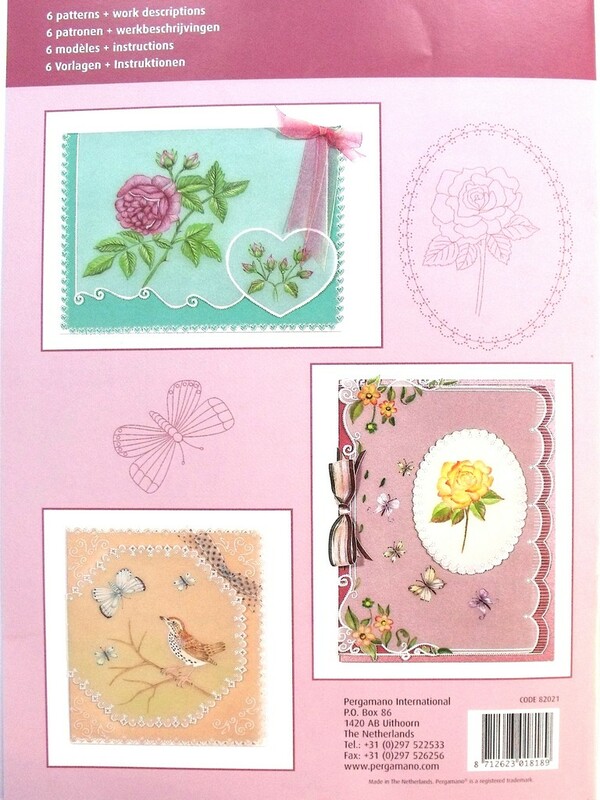 In M93 Spring flowers you will find six projects themed around spring flowers, such as anemones, daisies and roses. 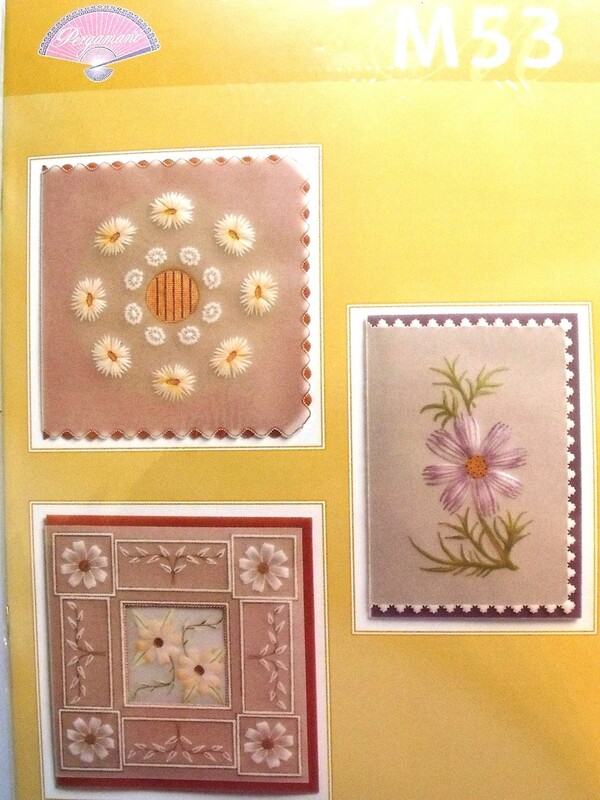 The flowers are beautifully worked in pastel colours using various painting techniques. Some projects are combined with delicate white work. 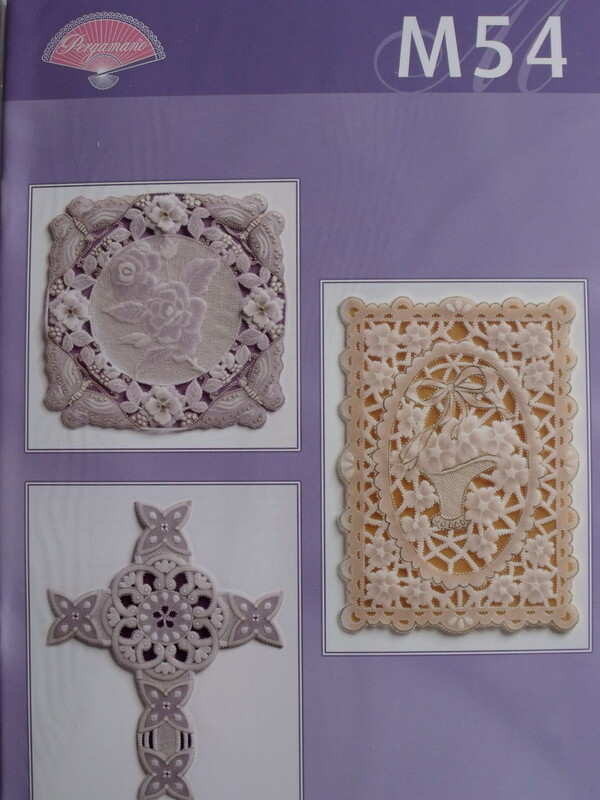 The magazine is highly recommended for intermediate parchment crafters. 6 patterns of still life and birds. 6 beautiful designs themed on the sun, stars and moon. 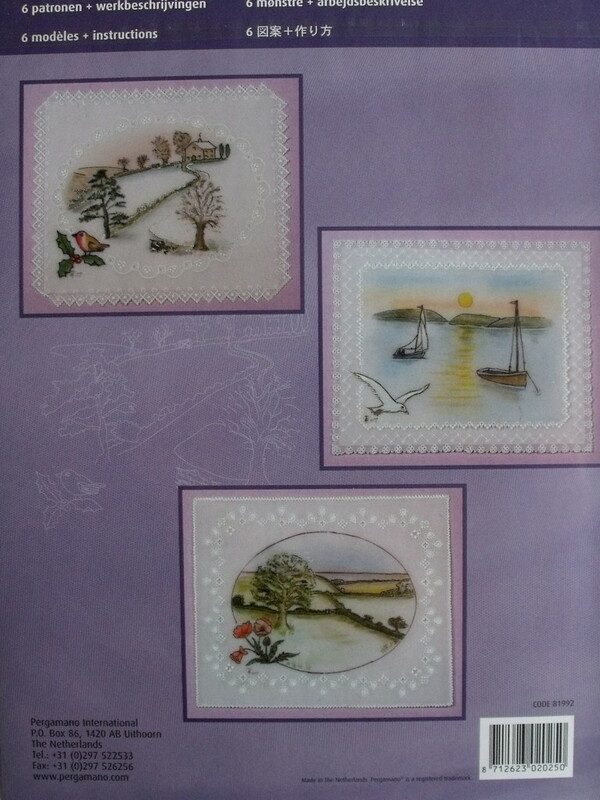 Six lovely white work patterns. 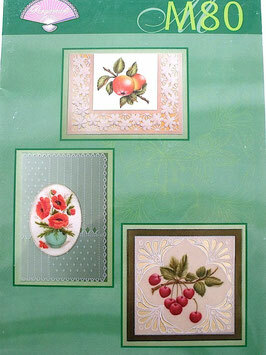 M80 Fruits and Flowers, six gorgeous designs using fruits and flowers. Pattern M78 from Pergamano. Six beautiful Christmas projects to make using the grids. Registered Pergamano teacher Nadine Guenard made M77 Traditional Christmas with vellum black and she proves once again how beautiful working with vellum black can be. The embossing and perforating work show extra well through thecontrast offered by the black vellum. 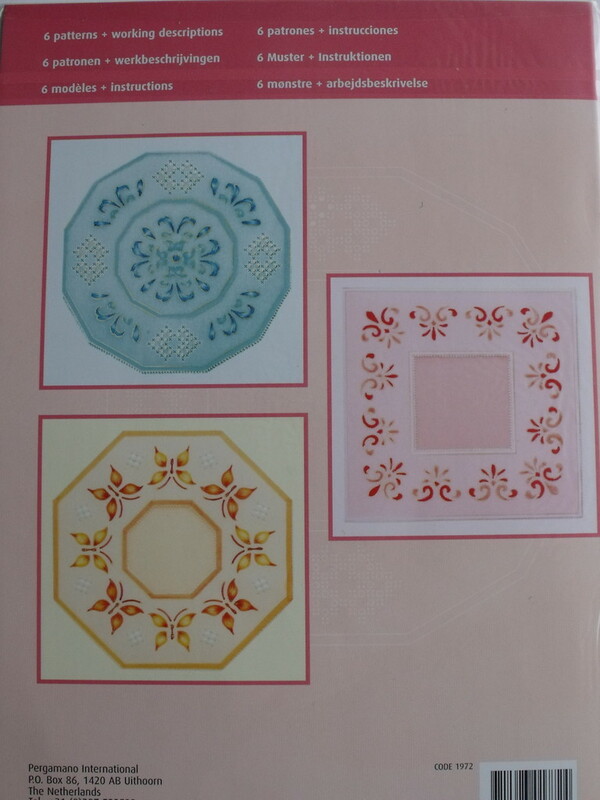 The pattern contains 4 patterns for Christmas cards, one pattern for a box and one for a candle holder. Pattern M75 from Pergamano. Six lovely snowmen designs to make for Christmas or a winter celebration. Pattern M73 from Pergamano. Hiskia Wittenaar has designed these beautiful folded cards.The special folding is combined with detailed paint work and beautiful decorative borders. 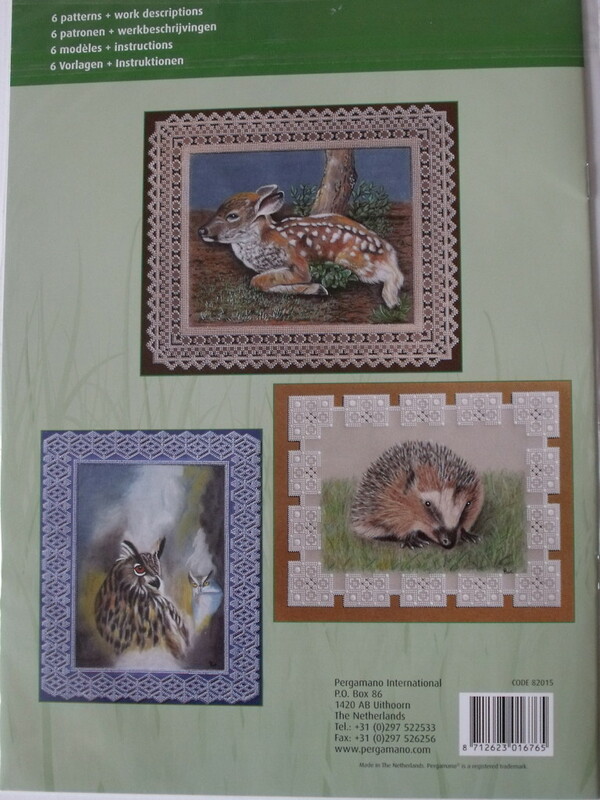 In the pattern book you will find the work descriptions, colour examples and patterns for the projects. 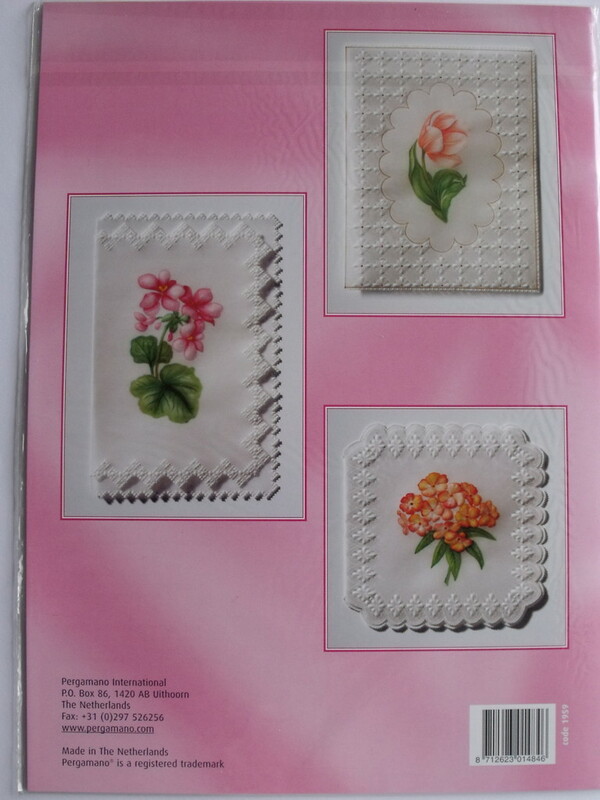 Pattern M72 by Gerti Hofman embroidering on parchment paper. M70 Colourful Black, six designs. As the title leads you to suspect, black vellum has been combined with colourful parchment paper in this magazine. 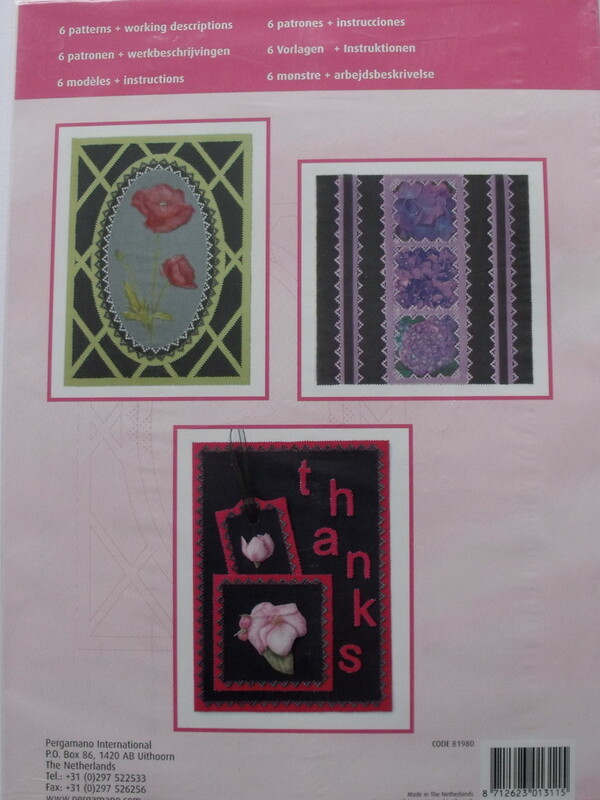 Registered Pergamano teacher Mieke Sprenger has designed the five cards and gift envelopes using contrasting colours to create colourful designs. Inside the magazine you find the work descriptions, colourexamples and pattern to the projects. 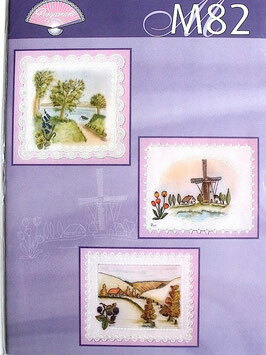 M66 is called Vellum Designs, the designers include Registered Pergamano teachers Mieke Sprenger,Hiskia Wittenaar, Monique Wienk and Gerti Hofman. 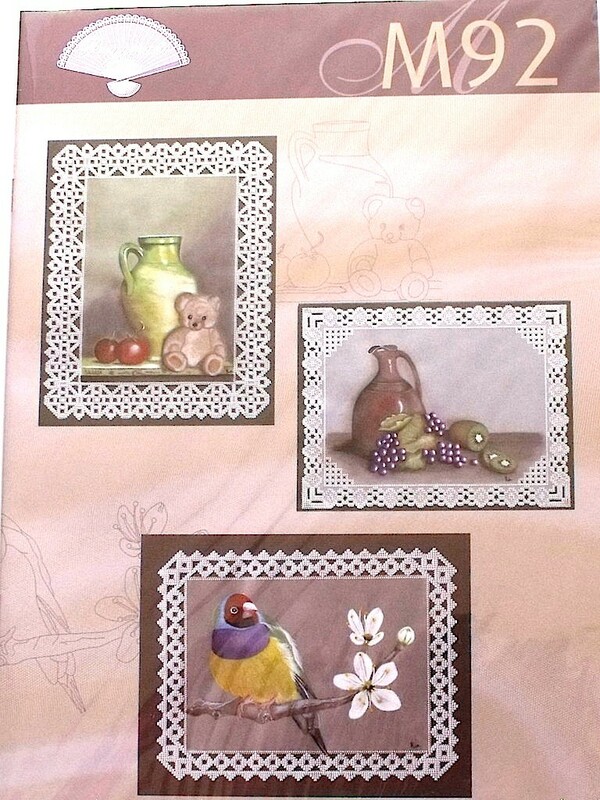 In this pattern book there are 6 projects created using vellum. 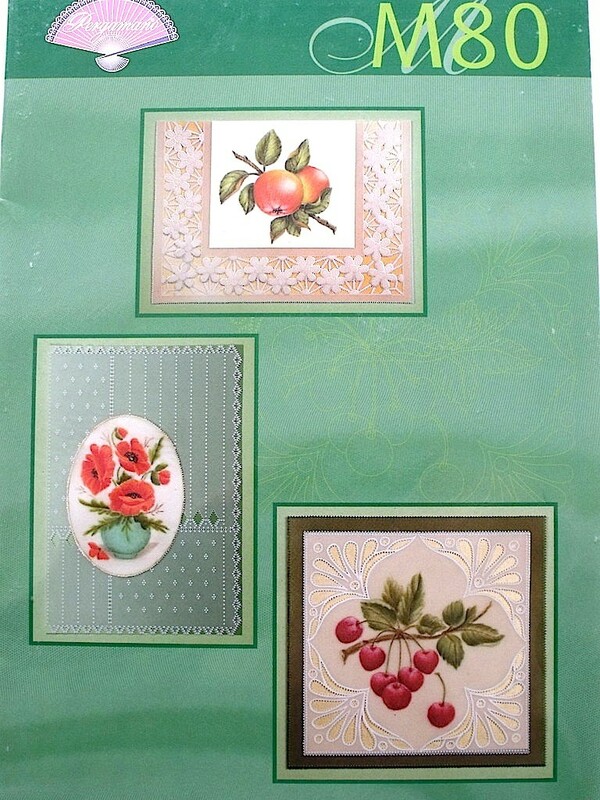 A challenge for everyone on how to make beautiful cards using vellum! 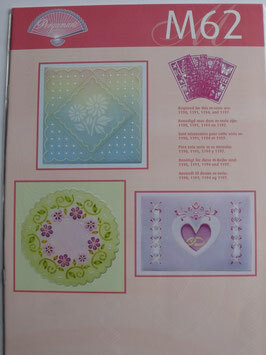 Inside the magazine you find the work descriptions, colour examples and patterns for the projects. Registered Pergamano teacher Daniëlle Benz and Waltraud Gessner made this magazine M64 Grid diagonal patterns. 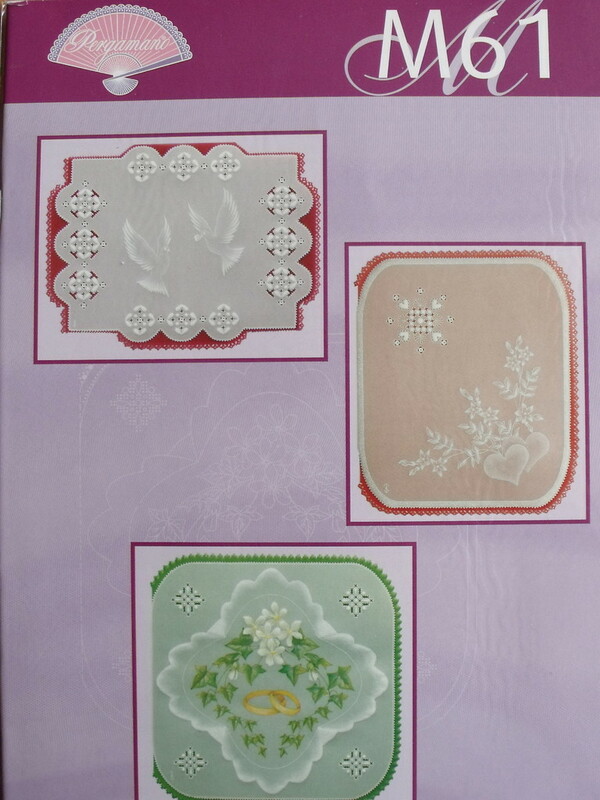 The six designs all have a religious character, think of gorgeous church windows, a card with a star and various designs with cross motifs.Especially the cards made with several layers coloured parchment paper are a challenge to every parchment craft enthusiast. 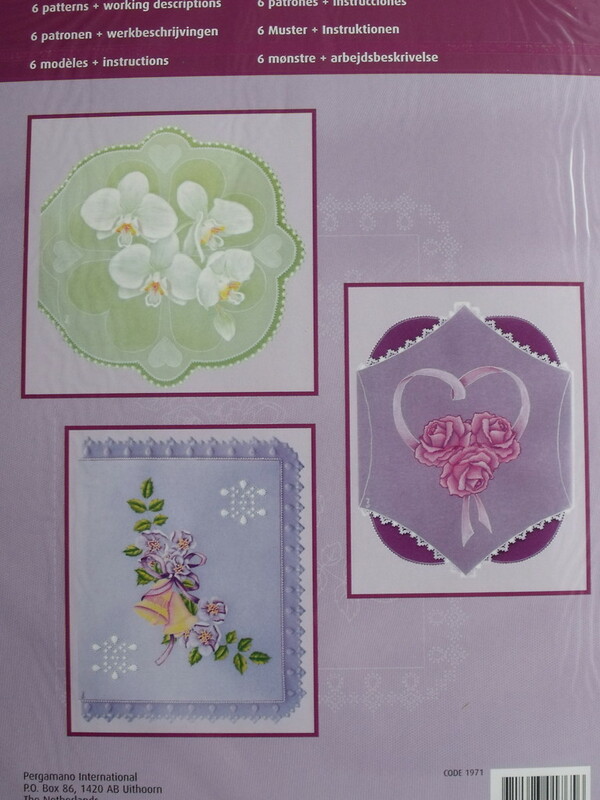 M61 six lovely designs for wedding cards. Registered Pergamano teacher Hiskia Wittenaarlike to be inspired by nature. For M59 Luxurinace of flowers she has let nature play the leading role. 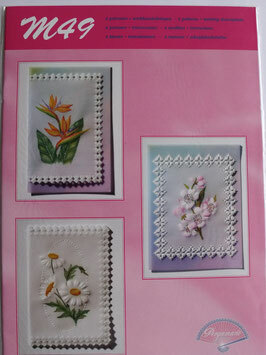 The magazine contains six cards with painted flowers and to let these flowers show even better they are surrounded by beautiful white work. Classic designs are the theme for M54 magazine. 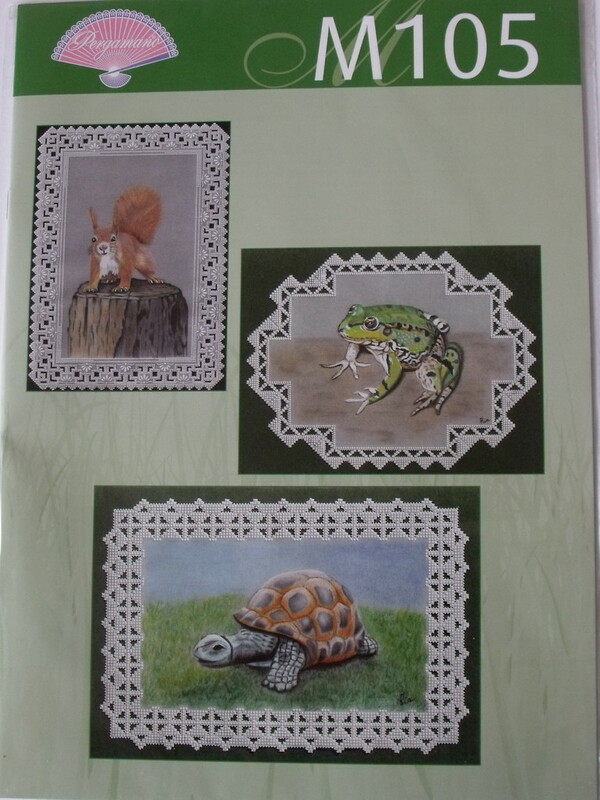 The magazine was compiled by registered Pergamano teacher Mieke Sprenger and contains perforating, embossing and combinations with painting. 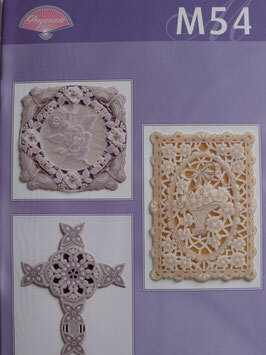 It contains six projects most suitable for the advanced parchmentcraft enthusiast. Inside the magazine you find the work descriptions, colour examples and pattern to the projects. Painting with tinta ink is a painting technique which is not often used. All the more reason to devote a magazine to this technique; M53 Painting with tinta.It contains six projects most suitable for the advanced parchmentcraft enthusiast. Inside the magazine you find the work descriptions, colour examples and pattern to the projects. 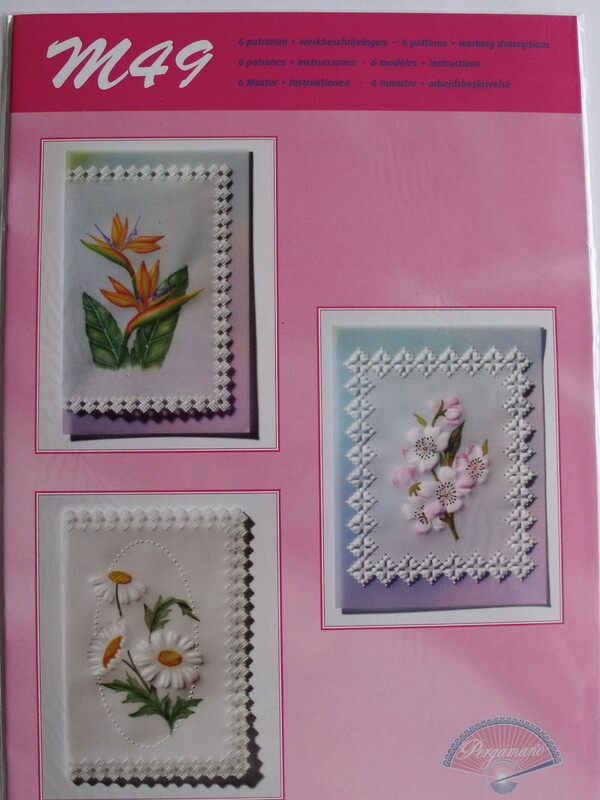 Flower Parade is the M49 pattern book designed by Registered Pergamano teacher Kyong Talbott who has used nature for the inspiration behind this magazine. 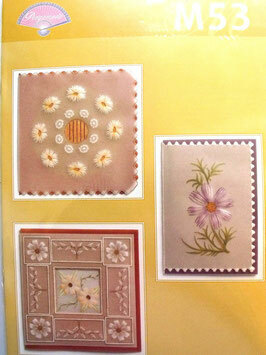 Six different flowers are featured, all are framed by a matching border. 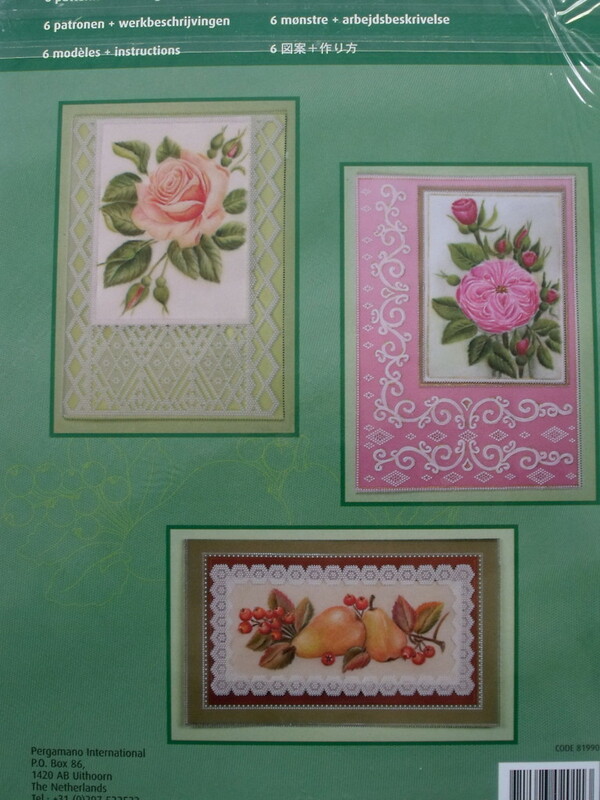 All flower pictures are painted using various colour materials. 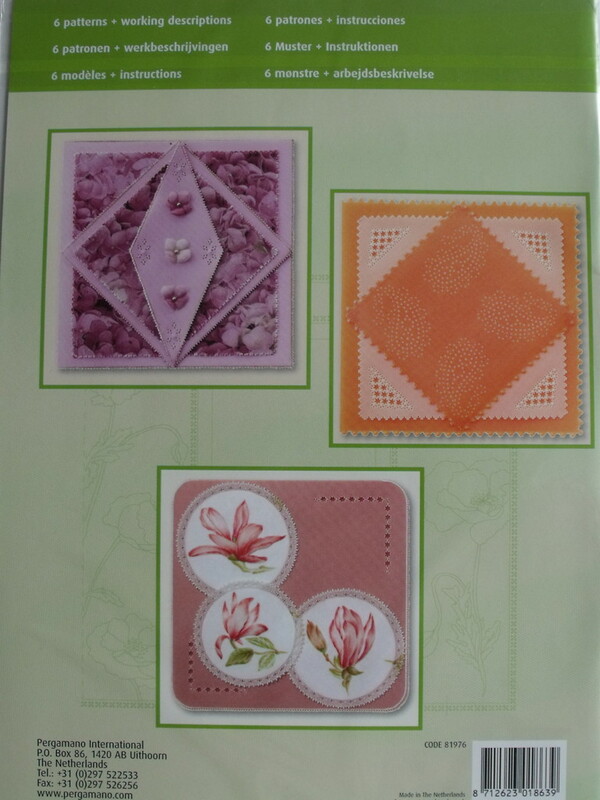 Inside the magazine you will find the work descriptions, colour examples and pattern for the projects. 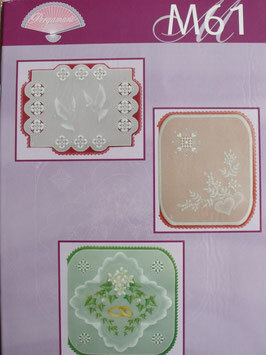 This pattern book offers a challenge for the parchment craft enthusiasts who love white work.The projects are slightly larger than average and are therefore extremely suitable for framing and all have a typical Asian feel; the designer Julie Roces has clearly let the influences from her surroundings show in the pieces. Inside the magazine you find the work descriptions, colour examples and pattern to the projects. 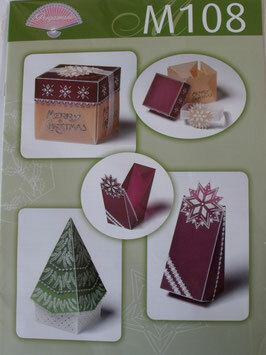 Seven beautiful Christmas projects can be found in this magazine M46 Christmas consisting of 6 cards and 1 box. Inside the magazine you find the work descriptions, colour examples and pattern to the projects. 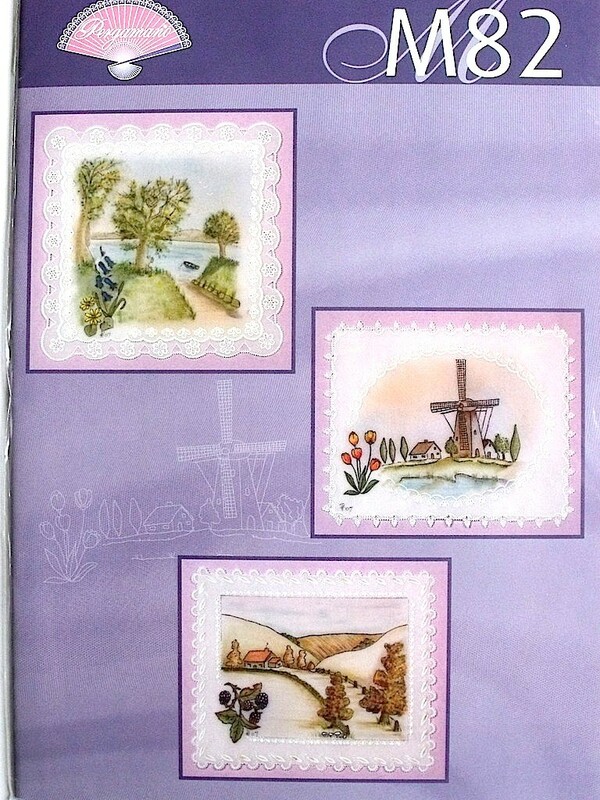 This pattern book is designed by Loesje van der Berg using 3D parchment techniques. 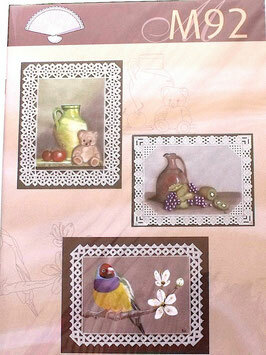 Seven designs which show you clearly show you how well 3D parchment can be applied to parchment craft. 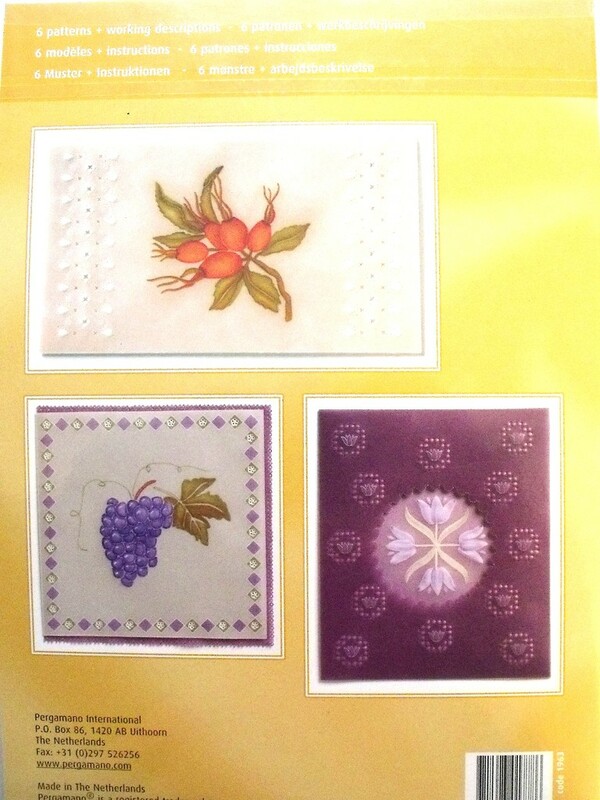 Several types of coloured parchment paper have been used and combined with3D elements and techniques such as cutting and perforating.